Imagine that from the position of view of reality in physical has a limiting scope of about and around the self, what you can see, what you can hear and what you act physically with. Then same methodology towards thoughts whereby more scope as what you think can be limitless, then same to be said emotional broader than that and vibrational broader than that so that spiralling outwardly like a vortex grow outwardly as it gets wider. Imagine that in any direction up, down, left, right. 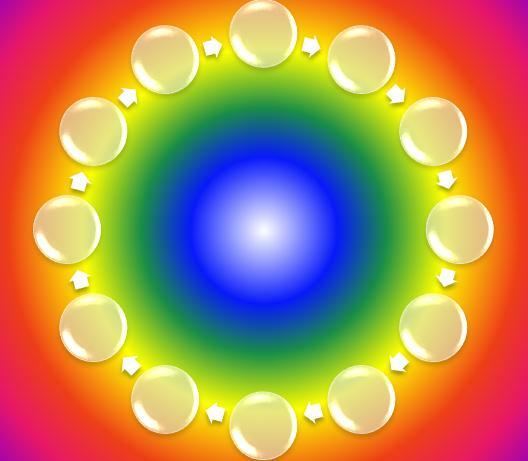 Add in colours to the equation and vibrations as when energy moves it vibrates. Sense can pick up by the directional focus of sense parts thereof the vortex which can be anything in the universe mostly directed towards that which is close by and emotionally or thoughtfully. Telepathy or teleportation becomes a plausible reality. 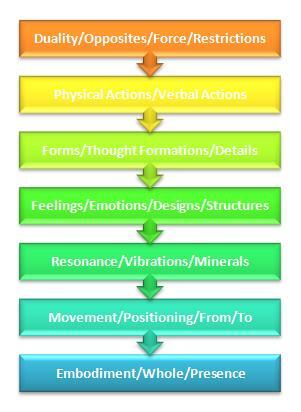 Taking the position of physical view and interaction and the vibrational view of interaction the vibrational aspects have greater resonance with all other things than just the self, so that those vibrations resonate within others, as in other life forms not just human. Animals, plants, trees …etc are included so we inspire by means of vibrations or emotions that to which we desire, this is why what comes around is difficult to see in terms of forms or objects as it relies upon the interpretation of the self’s comprehension in deciphering the vibrational aspects into emotional relevance and duly thought forms and physical interactions, how we talk like when someone from another country whom has been living a different vibrational place geographically on the planet comes to another place speaking the native language with that vibratory tongue, slightly different twang or accent to the same thing, i.e.. the language, words. Not going to guess how a tree or planet interprets the vibration and the limits it has with physical interaction but the relevance is true and the internal comprehension to the self is true. So what we give out in the way that give inward becomes ever present as part thereof the whole not just of the self but of all living things, energy does what energy does and evolves by movement to become greater than that before it in any direction. We currently development more of our right brain than our left as our left has been very developed in ancient periods, the combination of the seems to me a greater drive or achievement to balance the self and duly growing inline with the planet and universe. This also applies a mental aptitude towards space whereby if you can think of a planet and see it then you are actually with it as in the energy and light streams to become present in you, we are nowhere but everywhere as an individual or not. Walking day by day with this mentality seems extremely far reaching but there again is there so be it as a reality, the abilities of reality inspire the abilities of the reality, if you believe truly that something is it generally is to you. Dependant on various energy positions and design of life set by you everything and all things are interconnected and possible. No more questions as the question negates the answer, the depths of self give rise to comprehension that transpires the answer so moving forward or backwards evolves the self understanding or knowledge so a metaphor of sitting in a rowing for life is a good one as what comes to you is for you to interact with and inspire towards your visions, inspiring the easy life does not take money but the perception of money the freedom to become that to which is abundant to you.